Russell Westbrook had 51 points and a triple-double and scored the winning points in the Oklahoma City Thunder's 113-110 overtime victory over the Phoenix Suns on Friday night. According to the Thunder, it was the first 50-point triple-double since Kareem Abdul-Jabbar had one in 1975. 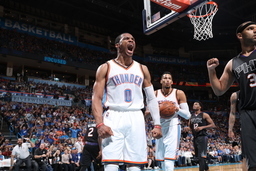 Westbrook finished with 13 rebounds and 10 assists and took a career-high 44 shots. Westbrook was 17 of 44 from the field, 2 of 10 from 3-point range and made 15 of 20 free throws. Westbrook has 38 career triple-doubles. He scored 39 points in the second half and overtime. The Suns led by 18 in the first quarter, but Oklahoma City held Phoenix to 5-for-26 shooting in the second quarter to cut it to 53-49. Westbrook missed several chances to put the Thunder ahead in the closing seconds of regulation, and Phoenix held on to force overtime. Thunder: Domantas Sabonis, a rookie, started in his first-ever regular-season home game. He finished with eight points on 4 for 6 shooting. ... Backup point guard Cameron Payne sat out with a fractured right foot. ... Westbrook was issued a technical in the third quarter, but it was taken away upon review. ... Victor Oladiposcored 21 points. Westbrook's averages through two games are 41.5 points, 12.5 rebounds and 9.5 assists. Suns: Sunday, they travel to Golden State to face former Thunder star Kevin Durant's new team.